I’m sure there are a lot of blog posts with similar, if not identical, titles this morning. But it bears repeating until the numbers sink in. One in 88 children. One in 54 boys. A 78% increase over the past five years. In my state, the incidence is significantly higher. The numbers are so alarming, and rising so quickly, that they risk having the opposite effect — they risk becoming ignored as outlandish or worse, accepted as normal. I do not pretend to know the cause. Clearly better, and wider, diagnoses are a significant contributing factor. How much is caused by something else, and what that something else could be, is well beyond the scope of my understanding. But what I do know is this: those numbers are unsustainable. And by unsustainable I mean even the best public support systems will collapse under the weight of the load. Yesterday was IEP day for our family. Just for fun, it was triennial re-evaluation day as well. We spent two full hours sitting around a table with no fewer than eight people from our public school system discussing our son’s evaluations, eligibility, placement and educational program for the coming calendar year. Eight people — case manager from his current school, case manager from the school he will attend next year, general ed teacher, resource room teacher, aide, school psychologist, speech therapist, occupational therapist — times two hours. That’s sixteen hours right there, devoted to one largely procedural session for one child. That says nothing of the countless hours more spent observing, testing, scoring the tests and writing up literally hundreds of pages of documents again related to one procedural session for one child. Hundreds of hours spent on one child, and we haven’t even covered a single minute of actual therapy or special education. You start doing the math and it makes your head spin. And my child is mildly affected and high-functioning. How can this system possibly support the avalanche of kids that will be diagnosed and added to the special education rolls in the coming years? I have no desire to argue politics or causes. It saddens me that there are ongoing divides in the autism community. My only wish is that people will look at the numbers and the staggering rise and realize there is already an enormous crisis on our hands, one that will affect not only special education kids to come, but general ed kids as well as the system is put under more and more strain by the numbers of the newly diagnosed. And so it is my personal choice to continue to support Autism Speaks in it efforts to find better and earlier diagnoses, more effective methods of treatment as well as to understand why this is happening. With World Autism Awareness Day and Autism Awareness Month upon us, I hope that those who are able will consider supporting Autism Speaks or another worthy organizations — of which there are many — with a donation. At these rates, autism is not just a problem for parents of kids on the spectrum. It is a problem for our society. April is Autism Awareness Month. Please considering supporting one of the many worthy research and support organizations. P.S. 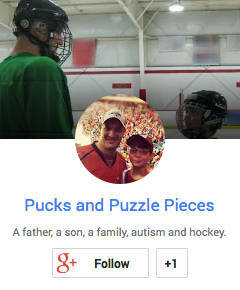 — Since this is an autism/hockey blog and we’ve been 100% hockey free today, I feel the need to mention that I did raise issues with the evaluation of Ryan’s paragraph abut why Canada is his favorite place in the world. I don’t know if I scored any points, but I tried. P.P.S. — Sharks, we need to talk. Ninth place with four games to go. Did you know Ryan’s IEP contains mention of both your team and Joe Thornton? How about paying the kid back with a couple Ws? It’s funny, because I know how many people spend an incredible number of hours with my one child on a day to day basis, but when you put it like that: 8 people, two hours, not even on actual services, that makes an impact. When I think about the person power behind educating and getting therapy to my child, it is staggering. And he is only one. That is the same thoughts that I had when I read the story yesterday..how can this be?? The first thing that I pictured in my mind in ten years from now…how will the schools be able to handle this, where will these children live as adults? What type of jobs will be available for them. Why is is just boys? Just a wide open wound…staggering, that is the only way I can describe the way I feel right now. I have a son who is almost nine years old, he was diagnosed with Prader-Willi Syndrome at 4 weeks old, and diagnosed with PDD-NOS at five. He is doing well, but it has been a TON of work to be where we are. I have been fortunate enough to quit my Accounting job when he was born and put my entire being into his world…too much to say here….so I will stop…. Staggering…and these are the numbers collected in 2008. I’m not a math person but, extrapolate the rate of acceleration to guess the number of children with an ASD diagnosis today, in 2012. A societal crisis indeed. If you have a link re: rates by state, I’d love to see those numbers. Thanks! Diane – “wide open wound”.. Yes. Exactly. I knew the ‘new’ stats were coming in, but it still took the wind out of me when I read them. Even worse, was viewing the stats from the state he was born: 1 in 29 boys. I collapsed in the hall in tears. And, this is just for kids born in 2000 (8 year olds in 2008) – my precious boy was born in 2004. I hate the divide in the autism community. Regardless of our views on potential causes, treatments, valid autism organizations, etc., we ALL need to unite as a community. This is an epidemic. My husband and I had a similar discussion last night. We know how many resources Tate requires every day at school. How many people are charged with helping him navigate the school system. Multiply this by the numerous others, and it is staggering. I’ve had IEPs for my son with 15 people that have lasted 3+ hours. I wrote a paper in college on the effect the LRE is having on the classroom teacher. It is a crisis which is largely being ignored because there is no money to be made by corporations. Sad. My son has Aspergers, and I have Aspergers. I think there is a difference between autism and Aspergers, though. Aspergers has been in my family for generations. The autsim seems to be directly related to environmental triggers.